IPIS always endeavours to conduct research in collaboration with local partners. For example, our four paper series on the role of the United Nation’s Guiding Principles on Business and Human Right (UNGPs) in Uganda’s oil sector has been a collaborative effort between IPIS and ActionAid Uganda. Recently, IPIS’ funders – the Belgian Development Cooperation – decided to fund a pilot learning and capacity enhancement project whereby IPIS can work at an enhanced level with partners in the global South. In particular, this pilot will focus on enhancing the long-term capacity of Southern actors with regard to business and human rights understanding and research. 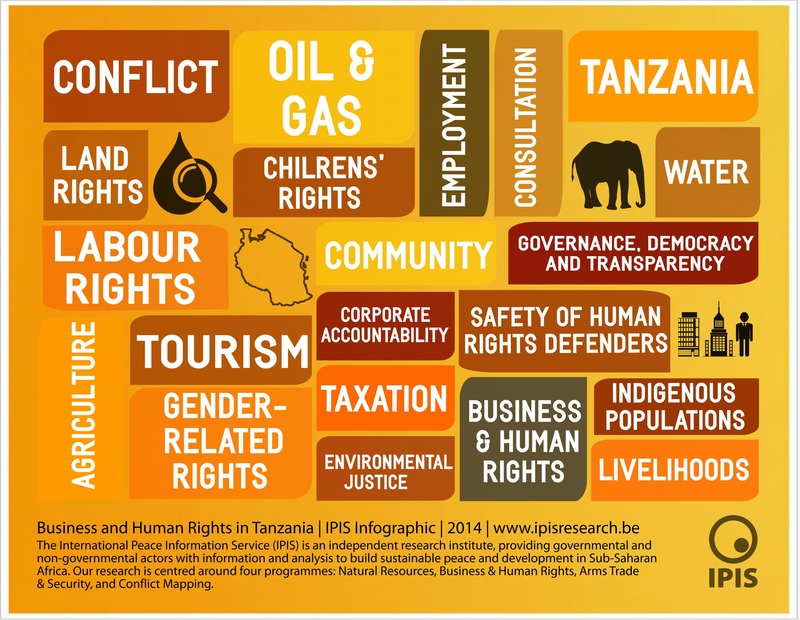 Tanzania was chosen due to its geographical proximity to IPIS’ existing countries of work, and civil society’s colourful, but not yet abundant, work in the field of business and human rights. IPIS has conducted a number of parallel trainings in Uganda. However this learning programme is novel in the sense that the Belgian Development Cooperation has provided IPIS with funding that will allow for us to plan for a long-term engagement with partners over a number of years. This is enabling IPIS to continually develop tools that will allow us and our Tanzanian partners to learn from one another, build up one another’s capacities, and eventually make a tangible positive impact on the business and human rights agenda in Tanzania. On August 18 and 19 IPIS conducted a training on business & human rights in Dar Es Salaam. The training was planned and organised in close cooperation with the Tanzanian national human rights institution, the Commission for Human Rights and Good Governance. The training was designed, led and facilitated by IPIS Analysts Gabriella Wass and Anna Bulzomi. In addition, the Business & Human Rights Resource Centre (BHRRC) – represented by Joe Kibugu – was involved in organising and facilitating a session on investigating allegations of human rights abuses in East Africa. Participants spanned international businesses, ESG management consultants, non-governmental organisations, advocacy and research groups and law firms operating in Tanzania and Zanzibar. The training was non-sectoral, meaning that it was open to all stakeholders working across diverse industry sectors and covering a wide array of ESG and human rights issues, namely stakeholder engagement in large-scale extractive projects, business & children, labour conditions in the tourism sector and human rights risks in artisanal gold mining. The collegial and hands-on nature of the training enabled all participants to exchange and learn from each other’s experiences. This paper summarises the main takeaways of this exercise, and sets the context for the launch of the IPIS Business & Human Rights Learning Program. In the coming weeks, IPIS will be publishing materials from the workshop. 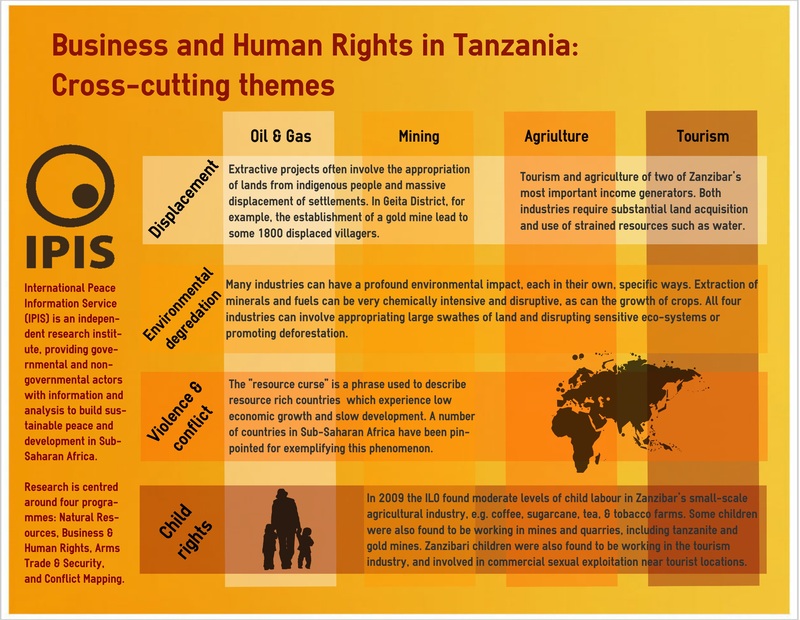 For now, here’s an infographic, illustrating how human rights issues cut across from of Tanzania’s key business sectors.